The differences between Android and iOS have been getting awfully slim lately. With each new software release, the two mobile operating systems look more and more alike, with each of them actively borrowing the best features from the other. As a result, though I’ve been an unapologetic iPhone user since the iPhone 5 came out in 2012, I’ve recently been casting some glances Android’s way. And with the advent of some cool enhancements in Android 6.0 Marshmallow and rapidly improving hardware (from Google and other vendors), I’ve become convinced that now just might be the perfect time to switch from iPhone to Android. Now, before you break out the torches and pitchforks, consider these six reasons why I’m thinking of making the switch. Apple gives you just two choices of smartphones: the 4.7-inch iPhone 6s (or 6) or the 5.5-inch iPhone 6s Plus (or 6 Plus). With Android, you have a huge choice of phones from a wide variety of manufacturers. For starters, Google itself recently unveiled the Nexus 5X (built by LG) and the Nexus 6P (from Huawei), the company’s answer to the iPhone 6s and 6s Plus, respectively. These devices are comparable in quality to Apple’s high-end phones, but at a fraction of the price. If those Nexus devices aren’t for you, you can still choose from a seemingly endless selection of phones, ranging from high-end devices like the Samsung Galaxy Note 5, Galaxy S6, Motorola’s Moto X, and the Sony Xperia Z5 to more budget-friendly devices like the super-cheap-but-still-excellent Moto G for $180. One of Android’s best features is Google Now. Google’s virtual personal assistant — yes, the equivalent of Siri — aims to give you the right information at the right time. And with Android 6.0 Marshmallow, that service is even better. 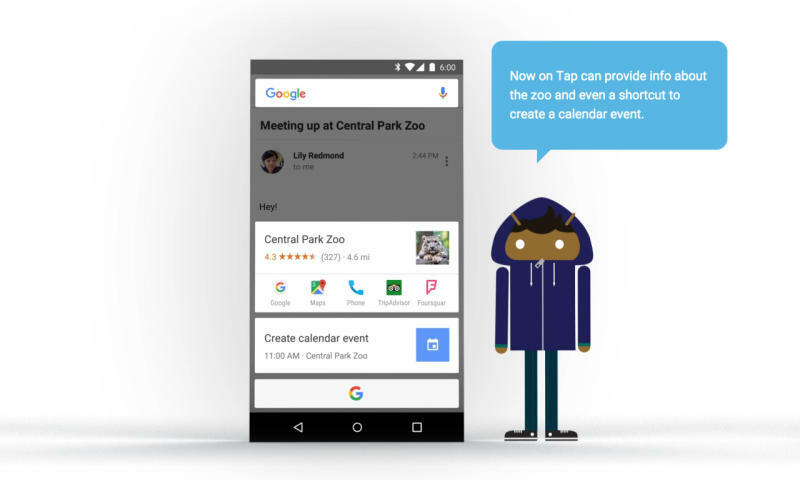 Google announced Google Now on Tap back in May at Google I/O and showed it off again on the new Nexus devices in September. The advantage of Google Now on Tap: It delivers all sorts of contextual information without having to leave the app you’re in. For example, say you and a friend are chatting in Google Hangouts about going to dinner. Holding down the home button will give you an at-a-glance look at the restaurant’s rating, an option to call the restaurant or even book a table, in addition to creating a calendar event and getting directions to the venue — all without leaving Hangouts. Google Now on Tap is a killer feature, and it’s one that the iPhone just cannot match (at least, not yet). While Apple is still using its own proprietary Lightning cables to power its iOS devices, Android phones are embracing more standard technologies such as USB Type-C. Both of Google’s newest Nexus phones, for example, have USB Type-C ports that provide fast charging. And the USB Type-C cord is reversible so (like iPhone users with their Lightning cables) Android users no longer have to worry about which way they’re plugging in their phones. Like the current microUSB cords that power most Android devices on the market today, the USB Type-C cables will soon be everywhere and, as a result, they’ll be much cheaper than Apple’s Lightning cables. One of the biggest gripes I’ve had with Android is how much more quickly the battery seems to drain than the iPhone’s. If I forget to plug in my iPhone overnight, the battery typically drops only a couple of percentage points. But if I do the same thing with an Android device, it’ll drop 20 to 40 percent overnight. That typically means it’ll die sometime the next morning. Fortunately, that’s about to change dramatically with Doze, a feature baked into Marshmallow that detects when you’ve left your phone alone for a long period of time. Once your phone is inactive and not moving for a while, the device enters Doze mode, which disables your data network, ignores wake locks, and shuts down all background processing. It’s basically like going into airplane mode, except it allows a few things like high-priority messages to come through, but for all intents and purposes your phone stops most things from running in exchange for boosting your battery life when your phone is idle for a long period of time. Then there’s App Standby, a service that basically stops apps you haven’t used in several hours from running processes in the background if your phone isn’t plugged into the charger. 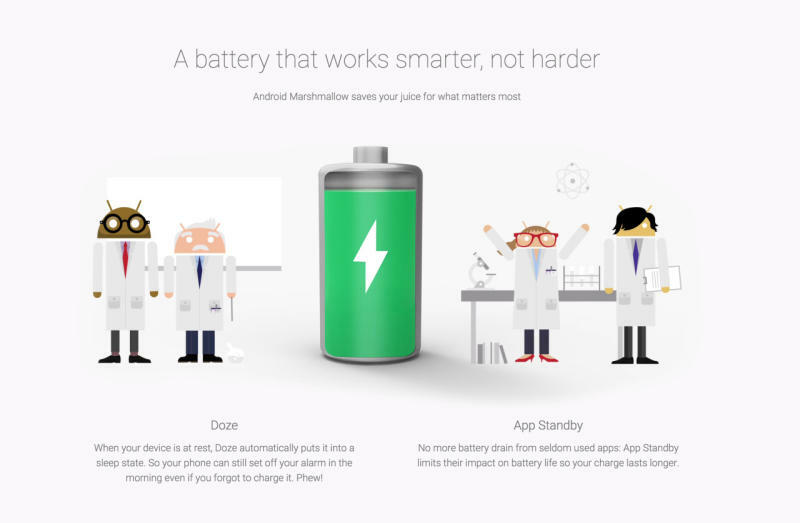 Combined, Doze and App Standby should work wonders on your Android phone’s battery life, which when coupled with the fact that many Android devices include larger batteries than the iPhone, could help your phone last longer than its iOS counterpart. The new iPhone 6s and 6s Plus devices have amazing cameras that shoot high-quality pictures and HD video. But they aren’t unique in that regard. Point being, while the iPhone once had a distinct advantage over Android phones when it came to camera quality, that’s no longer true. The iPhone 6s and 6s Plus both have so-called Retina HD displays — but their resolution still lags behind several Android phones. 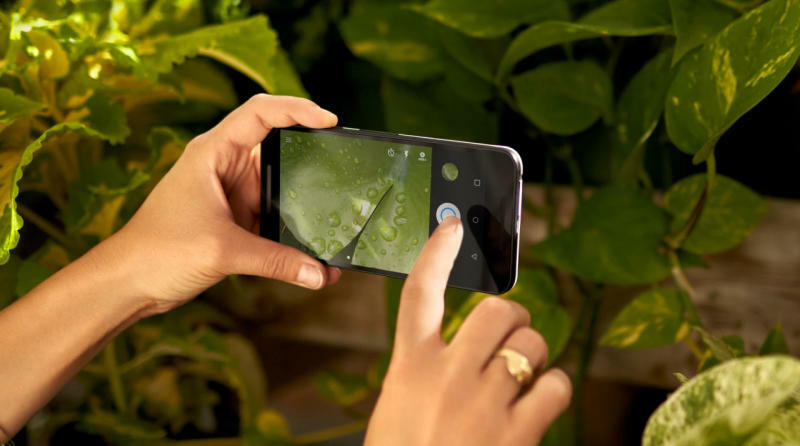 The iPhone 6s Plus, for example, has a full-HD 1080p display. But the new Nexus 6P boasts a 1440p display; some Android phones like Sony’s Xperia Z5 Premium actually have 4K Ultra HD displays built in. With that kind of resolution, Android phones can be way better than iPhones for games and high-def video. Sure, such high resolutions can be hard to discern on a 5- or 6-inch screen. But the difference is there. Android has always been a powerful operating system. But with the release of Android 6.0 Marshmallow — the best Android operating system to date — and the latest hardware from Google, Samsung, Sony, and others, now might just be the perfect time for even settled iPhone users to give Android a very serious look.